It's been raining and quite blustery most of this weekend. Made a nice hot pot of tea in my heavy blue teapot and then searched for an old pretty antique teacup to match it up. No mugs for me today. I had the perfect Spring teacup in mind. 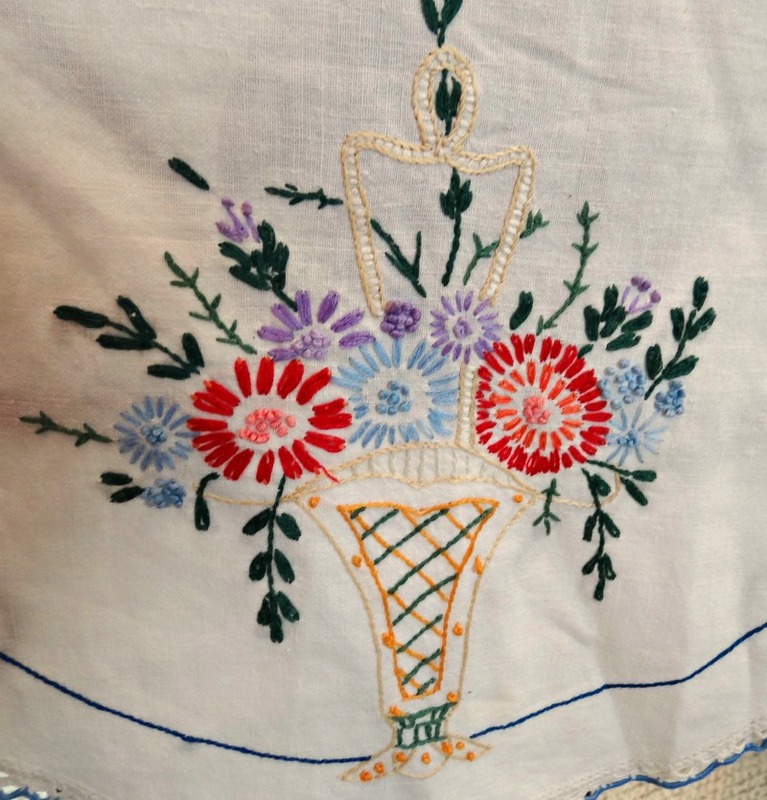 Whilst looking for this set I also spied this pretty vintage embroidered piece - so everything has a lil bitta blue. This weather has me feeling a bit blue, too. So today is perfect for a nice pot of tea, and for curling up with a nice quilt and a good book. This is an old Limoges set - an unusual combinations of colors. Can you see the spring pansies on it? This is very delicate and translucent. I love these old unique tea sets! I also love to find florals in the interior of a cup! 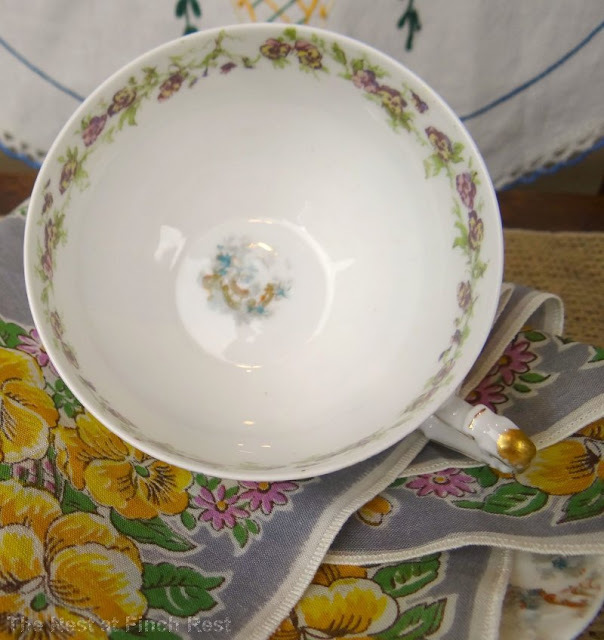 Here the cup is resting on a vintage linen piece with matching pansies dancing all along the rim of the cup and saucer. And yes, I am including a matching blue birdhouse. Yes, you have seen it before - but it always wants to stay close to its buddy The Blue Teapot, so it just snuck in the pic when I wasn't paying attention! What's a gal to do? Just roll with it, I suppose! Heaven's light that breaks on mists of earth! ~Have a wonderful week, everyone! Your blues are all so beautiful and springy. I love delicate china. That tea cup is gorgeous! What a beautiful teacup & saucer! They are so very delicate looking. We've had alot of dreary & rainy weather as well. It's a perfect day for a cup of tea & a good book. Now, if I could just skip work today, I'd be all set! Lovely blue tea pot and the limoges. I love Limoge..so dainty. Here the weather is cold and miserable. Where have the sunny spring days gone! That is a beautiful pattern, Michele! I love the shade of blue in that teacup. It was rather a chill-your-bones kind of day yesterday. That cup and saucer is just beautiful. Cold and rainy here, too. Rain, rain go away! Rainy days make me moody too. Cozying down with tea is the perfect solution. Love that delicate Limoges cup. Have a terrific week! I hope you get some sunshine back! P.S. I am hearing goldfinches again! They're my favorite bird! I hope you get an abundance of May flowers from these April showers. Thanks for sharing your blues. The teacup set is so pretty! And we are finally having some sunshine here and I am enjoying it so much! Have a wonderful day Michele! Limoges china is always beautiful. Nice tea setting with the birdhouse and the blue tea pot. I saw my first gold finch today! I'm thrilled that they are back! What a wonderful post filled with blue! Love your teacup and the wee birdhouse. Love the teapot too. I'm always happy to have you join me for tea. Thank you for your sweet comment and have a lovely week, my friend. Like Sally said, April showers bring May flowers! 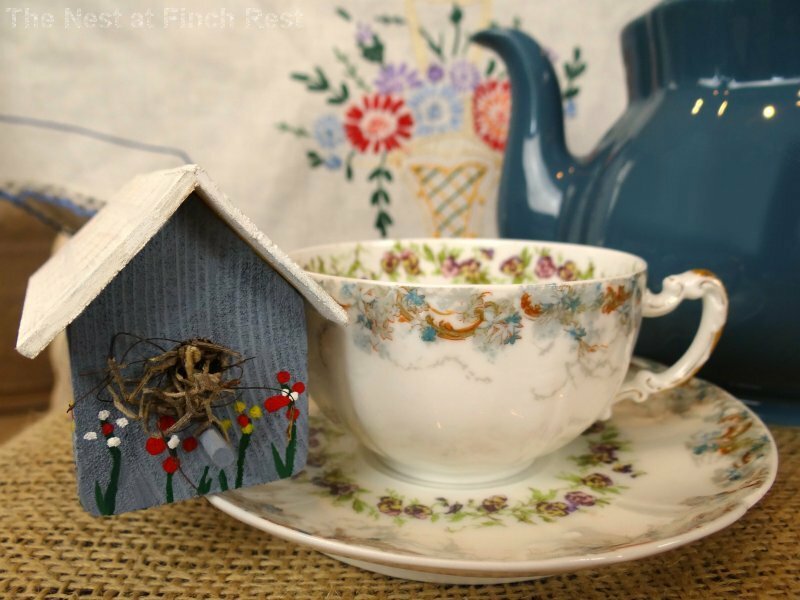 Gorgeous tea cup and love the embroidery and the birdhouse too! Happy Spring - it will come, don't despair! Michele, I know, I talked to my Mom and sister and they said that it was so cold in Columbus. They had the heat on!! I can see why you needed some warmth and comfort with a cozy cup of tea in that beautiful teacup!! Love your vintage embroidered piece, too. Have a wonderful week and warm hugs sent your way! The cup is stunning Michele!!! I love the delicate floral pattern - it fits you well!! Weather in MN is also unpredictable, winter coat one day, light jacket the next. Wishing you a fantastic tea day!!!!! This whole weekend was perfect for snuggling with a blanket, book and a cup of tea. Feels more like March than April, but soon it will be hot and we'll be wishing it was cooler. I think I'll go get a book and crawl in bed. I love your blue teapot...and the teacup is lovely! The poem is right on...except we are having a mini heat wave here in the Pacific Northwest...up to 70 degrees! What a shock! A lovely tea cup! And that tea pot will chase the "blue" away! I LOVE your combo and that little embroidered piece is GORGEOUS! I always get WEAK IN THE KNEES for vintage needlework OF ANY KIND! AHHHH!!! What a lovely Limoges tea cup! I have never seen pansies on a Limoges tea cup before, so it is special to see your pattern. It is a really lovely one too with it's gorgeous coloring. I love vintage needlework, and yours is very sweet. The table is perfect with your special interpretation. 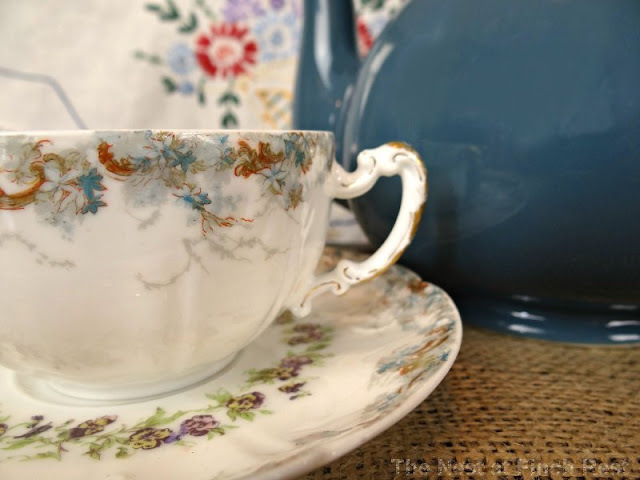 I appreciate those detailed photos of your gorgeous tea cups and embroidered piece.. Stunning! You wowed me a lot! All of your dishes are fabulous but this one bespokes elegance and grace. I like the colour of your teapot and the teacup is very pretty. The April Rain poem is nice, I should look for one that says April snow - we woke up to a white blanket this morning. That's a gorgeous tea cup - so pretty. I'm spying that pretty embroidered piece too. 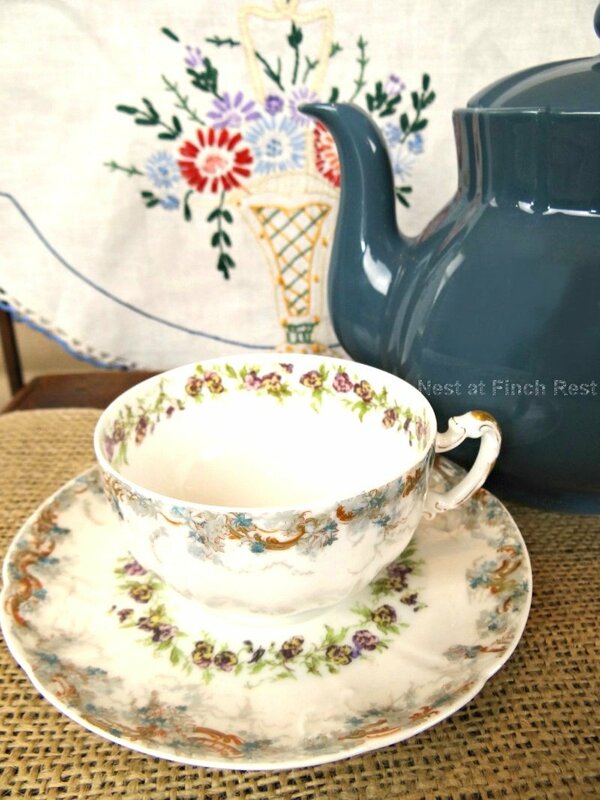 You've put together a pretty vignette with a little spot of tea. Thanks so much for popping in to see my little kitchen. You certainly created a sweet vignette. Love the teacup set and the tea pot. The embroidery is pretty. And of course the bird house just tops it off. I hope you have a great week. Thanks so much for your visit. Lovely blue! The teacup is gorgeous and the blue goes so well with your teapot. Add the sneaky little bird house (!!!) and you have a perfect setting for tea. I love old embroidery ... this is a lovely piece. Happy Tea Day! I love that color of blue in your teapot and matching cup and birdhouse! Everything matches so perfectly. Thanks for sharing tea and a poem. Hope you are feeling less "blue" today! Check out my post, called 'The Cup That Cheers' to help cheer you up! such a pretty post, michele! love the limoges and how it all blends together beautifully:) hope you get some sunshine! What a lovely spring poem. I love your blue teapot and other matching blues...your little bird house and beautiful teacup. Happy Teatime! Your shared such lovely blues with is all thsi week, Michele! I hope your Sunshine returned today. You are right, that is an unusual combination. Delightfully done and charming. Your cup is the perfect thing for a rainy day. Thank you for the lovely poem.